Lakshmi's NTR has received a U certificate from the Central Board Of Film Certification (CBFC) and is set for grand release on March 29. Later, Ram Gopal Varma had a meeting with senior actor Mohan Babu. Lakshmi's NTR is a controversial political biopic that is based on the life of former Chief Minister NT Rama Rao. The movie is inspired from the book written by his second wife Lakshmi Parvathi. It is all about how her entry into his life created a havoc in the politics of the united Andhra Pradesh. The film shows the present Chief Minister of the state, Nara Chandrababu Naidu as a backstabber of his father-in-law NTR. Lakshmi's NTR was initially slated for release on March 22 and Ram Gopal Varma had submitted its first copy to the CBFC in earlier this month. Since it is released weeks before the the assembly elections in the state, the CBFC apparently delayed its censorship with the pretext of Model Code of Conduct. Finally, the members of the CBFC have cleared Lakshmi's NTR for the release on Monday. The Board has given a clean U certificate with a suggestions for minor cuts. Elated Ram Gopal Varma took to Twitter late in the evening to share news with his followers. He tweeted, "Truth Won @ncbn Censor Board Cleared #LakshmisNTR with a UNIVERSALLY VIEWABLE U CERTIFICATE"
Lakshmi's NTR was facing another threat from the Election Commission (EC) as it is hitting screens during the elections. Ram Gopal Varma revealed that producer Rakesh Reddy met the EC officials on Monday. He reportedly hosted a special screening of the film for them. He explained to them that it is based on the book written by Lakshmi Parvathi, the second wife of Late N T Rama Rao and it focusses on his last years. 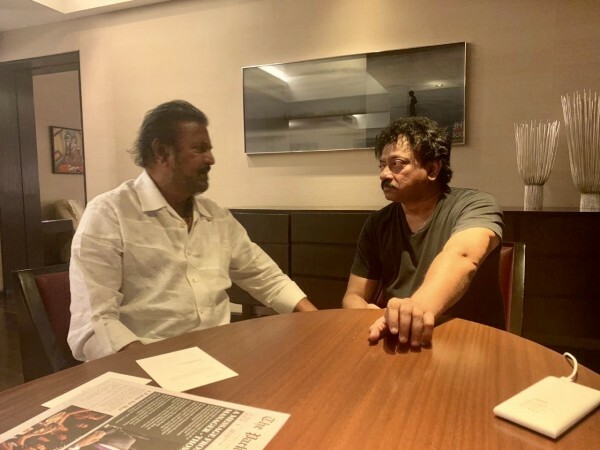 Late in the Monday evening, Ram Gopal Varma met Mohan Babu and the reason behind their meeting is clear. Since it happened few days after the senior actor held a protest against Chandrababu Naidu's government, it has sparked a debate and is creating a lot of buzz in the social media. After the meeting, Ram Gopal Varma tweeted some photos and wrote, "I never thought @ncbn was this b...d F...k ⁦#LakshmisNTR Sir, I am happy that at least now u are telling the real truths about @ncbn #LakshmisNTR I feel like slapping the VENNUPOTUDAARULU and clapping the ⁦@themohanbabu⁩ #LakshmisNTR"